Ever heard the saying "It's all in the delivery?" It might not ALL be in the delivery, but as a researcher, your goal is to not only provide information on a topic, but also to articulate that information in a captivating way that doesn't bore your audience! 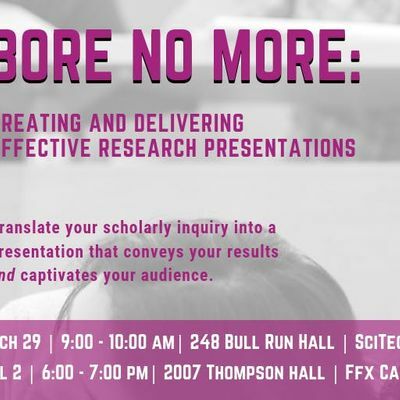 Join CEHD for Bore No More. 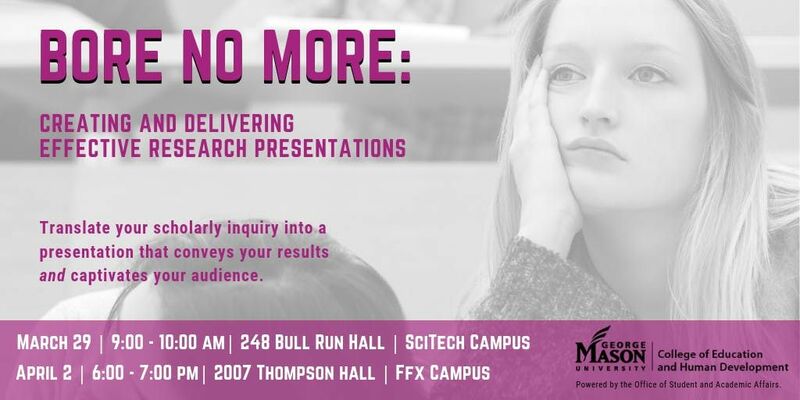 This interactive workshop is designed to help CEHD students learn how to prepare, practice, and perfect their oral or poster research presentation. Students will be given key information on condensing information, organizing their presentation from beginning to end, communicating effectively, and calming nerves. This workshop is highly recommended for all students participating in the CEHD Student Research Symposium on April 18, but is also a great resource for students presenting through OSCAR or at conferences outside of Mason.